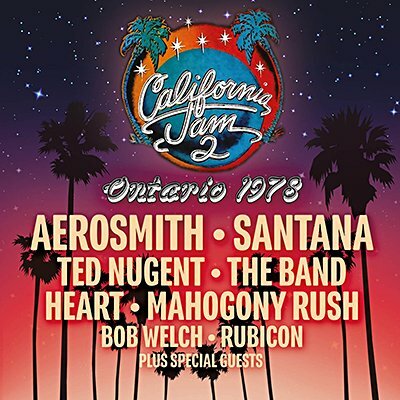 Bringing together a variety of acts from across the rock and roll spectrum in front of a crowd of more than 300,000, the anticipated sequel to the 1974 California Jam featured astounding performances from some of the biggest names in rock music who dominated AOR formats in the late 1970s. Hard rock heavyweights such as Aerosmith, Ted Nugent, Heart, and Mahogany Rush, shared the billing with upcoming funk-rockers Rubicon and the Latin-heavy contagion of Carlos Santana. Fleetwood Mac's Stevie Nicks, Mick Fleetwood and Bob Welch take their place alongside Dave Mason for an Anglo accent on the day's line-up while King Biscuit Flower Hour prepare for history in the making. Echoes proudly presents the entire King Biscuit Flower Hour broadcast of California Jam II, featuring a host of rock icons performing together at Ontario Motor Speedway, Ontario, CA on March 18th, 1978.